Health issues have made making blog entries difficult for the past couple of months, but I’m optimistic that all will be resolved shortly. My breast cancer crazy quilt block was completed in September and mailed to Leslie. She will be assembling the quilt and it will be donated to http://www.makingmemories.org/ She is a very gracious and caring person to take on this project, and we members of the crazyquiltinternational yahoo group wanted to help as much as possible. Hopefully, the organization makes a lot of money from the quilt. Earlier blog entries gave the details about the tucking and pearls for the fan shape. New additions are the Venetian lace heart motif hand sewn into place and then embellished with silver bugle beads around the interior border. The ribbon arcing around the fan base has tiny French knots made with a pale pink metallic thread from DMC’s Pearlescent Effects line. It’s hard to tell but the embroidered curved shaped along the side edges were sewn with stem stitch using the same pale pink metallic thread as the French knots. Then I whip stitched around the stem stitch base with a silver DMC perle metallic thread. 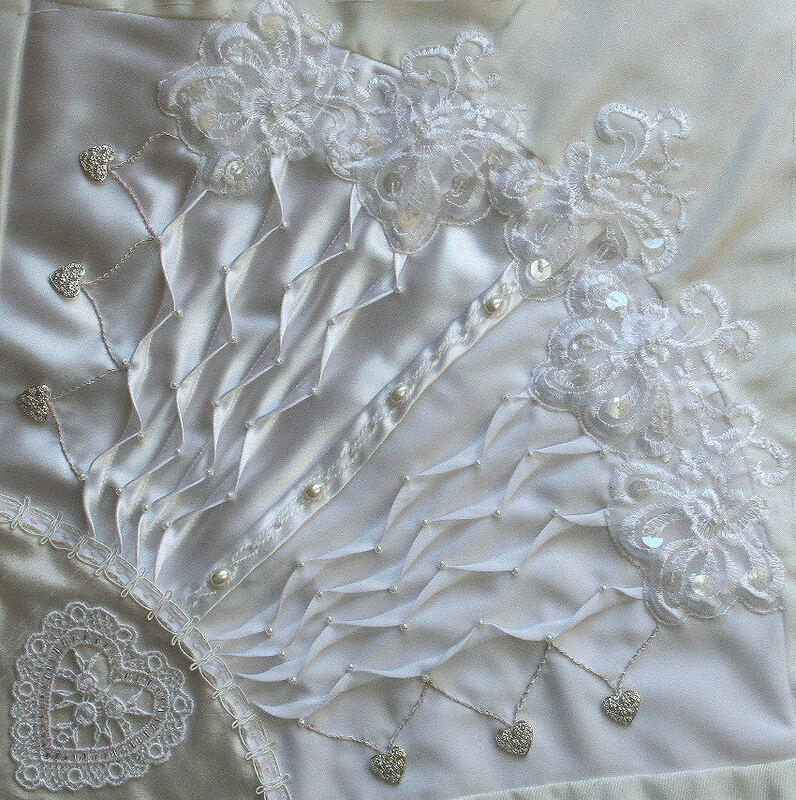 The silver filigree hearts were a Blue Moon bead that fit the heart theme of the quilt. This entry was posted on October 22, 2008 at 11:16 pm and is filed under Crazy Quilting. You can follow any responses to this entry through the RSS 2.0 feed. You can leave a response, or trackback from your own site. It’s beautiful !! Hope you get to feeling better. Love your B/C block – the pintucked fabric is gorgeous!